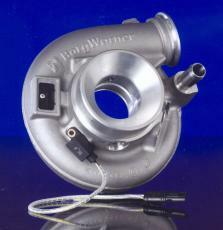 BorgWarner Turbo & Emissions Systems has developed a new turbo speed sensor. The eddy-current design is mounted on the compressor housing, with the end of the probe flush with the inside of the compressor cover. 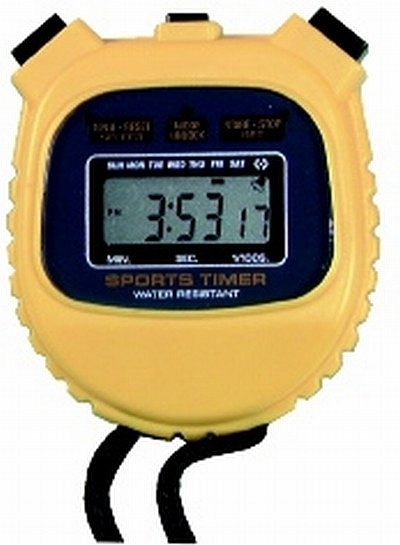 Designed to measure turbo rotational speeds from about 1000 rpm to 350,000 rpm, the sensor is non-contact and so wear-free. A smart sensor that takes a 5-volt supply and includes internal electronics, the sensor body can withstand 180 degrees C and the exposed tip up to 250 degrees C. The sensor has a service life of 1.6 million kilometres. BorgWarner suggest that a primary use of the sensor is in providing over-speed protection but the regulation of turbo speed by a feedback loop is another obvious application. As an input into the engine management system, along with temperature and ambient pressure, turbo speed measurement would allow the turbo to be run much closer to the surge line without danger. Bigger compressors and smaller turbines, allowing better low-down boost, would be the result. Along with electric assist turbos the future of turbocharging looks bright. Most of our Australian readers won’t be old enough to remember the release of the 1978 VB Commodore – and to be honest, at the time I wasn’t taking much notice of cars myself. However, it was common contemporary lore that the VB represented the new, small and modern family Holden while Ford, with the XD Falcon, persisted with the larger, outmoded type of traditional family car. With the increasing price of fuel, it appeared that Holden was onto a winner with the Commodore. But in fact they weren’t onto a winner at all: the VN model of a decade later went to a larger – especially wider – body, initially perched on the narrow track of the previous series. But new car buyers didn’t agree with the smaller VB-VL Commodore strategy – Holden would have sold more Commodores if they’d stuck with the larger body all the way through. 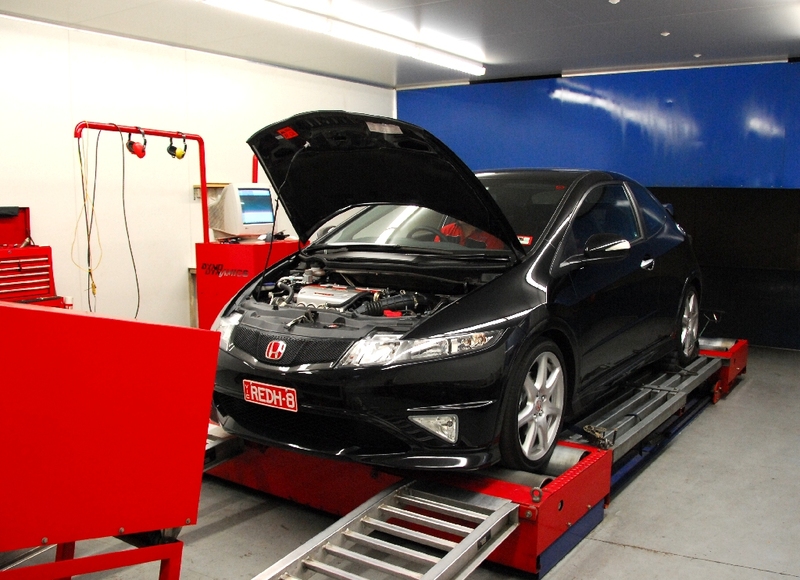 Today I returned Honda’s Type R Civic to the Queensland office. I am quite happy to see it go: I think the Civic Type R is a pretty weak car – something I make clear in our road test that will appear in AutoSpeed in due course. With a 2 litre naturally aspirated engine that revs to 8000 rpm and develops 148kW, it might look the goods on paper – but the reality is very different. To go further, I think the idea that small, naturally aspirated engines can compete with turbo cars is the stuff of fairytales. 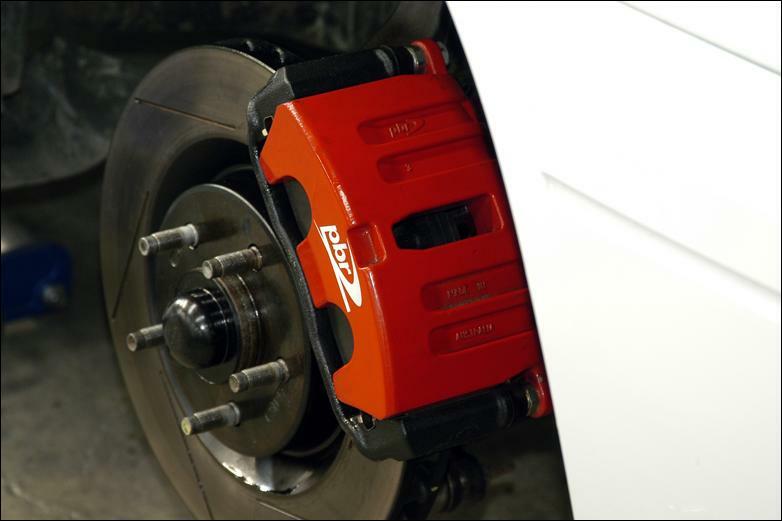 The Peugeot 206 GTi 180 and Ford Focus ST170 were similar cars in concept to the Type R Honda – all based around the idea that naturally aspirated, high revving engines have some intrinsic advantage over their forced induction competitors. That’s a purported advantage over turbo competitors that have more peak power – and vastly more average power through the rev range. 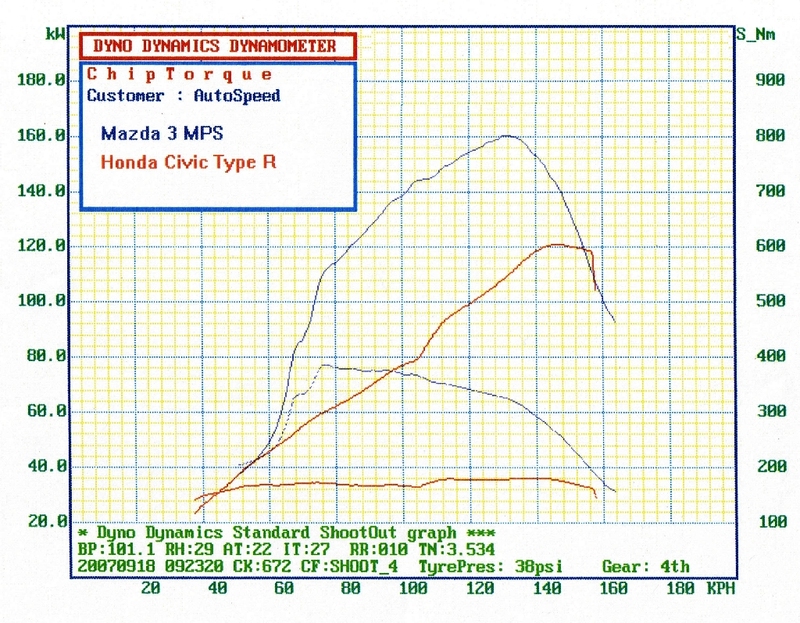 Nothing, but nothing beats timing the car on the road to find if performance improvements are really that. Over the years I’ve made plenty of modifications that resulted in no gains. 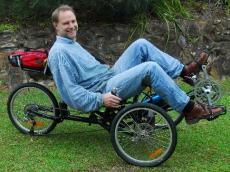 One of the first was to my Holden VL Turbo, which I owned when it was only a year or so old. I fitted a new aftermarket exhaust and found that the ‘before’ and ‘after’ times had not changed. That’s right: there was no performance gain. More recently, when Frank the EF Falcon had his new cam fitted, on-road stopwatch testing again sorted fact from fiction. 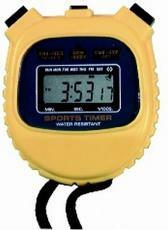 Despite feeling stronger, the stopwatch showed that the gains were trivial. Maybe everyone already knows about these – but I didn’t and since I have discovered them, they’ve been extremely useful. What I’m referring to are twisted wire brushes designed to screw onto angle grinders. You take off the grinding disc (and then leave off the screw collar – don’t lose it!) and then screw the wire brush onto the shaft. The angle grinder spins the brush so fast that the amount of material you can quickly remove is amazing. Compared with a wire brush you might use in an electric drill, you have much better control (using two hands rather than one) and can achieve results perhaps 20 times as fast. However, when using the brushes, you must wear full protection – goggles, ear-muffs and good clothing. The brushes tend to shed wires and at the speed they’re travelling, they could do eyes very serious damage. In fact, if you have a clear full length face mask, I’d suggest using that. When buying, take along your angle grinder (with disc removed) so that you can be sure of getting the right thread size. 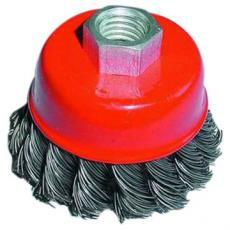 The twisted wire brushes are available at hardware stores and tool suppliers. I spent last weekend at Maryborough in Queensland. So what was happening in this pretty town, a little inland from Fraser Island? 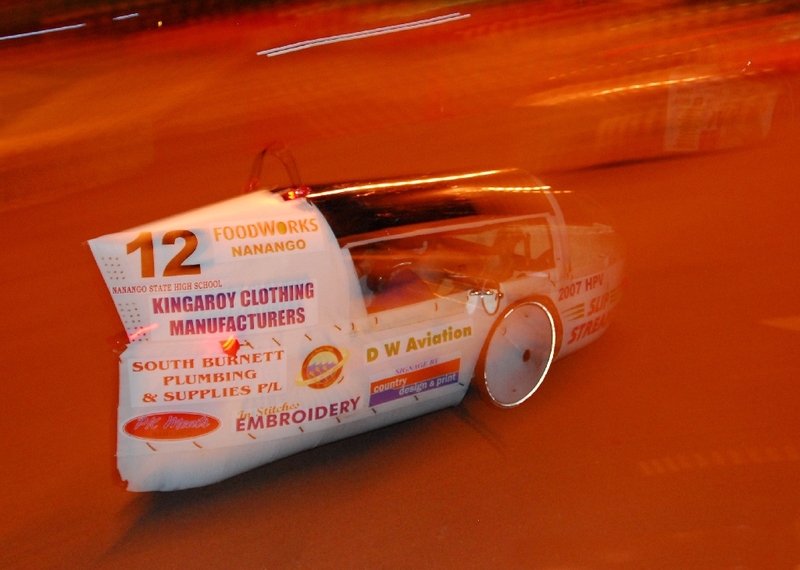 The Holden-sponsored Maryborough Technology Challenge (MTC), that’s what! 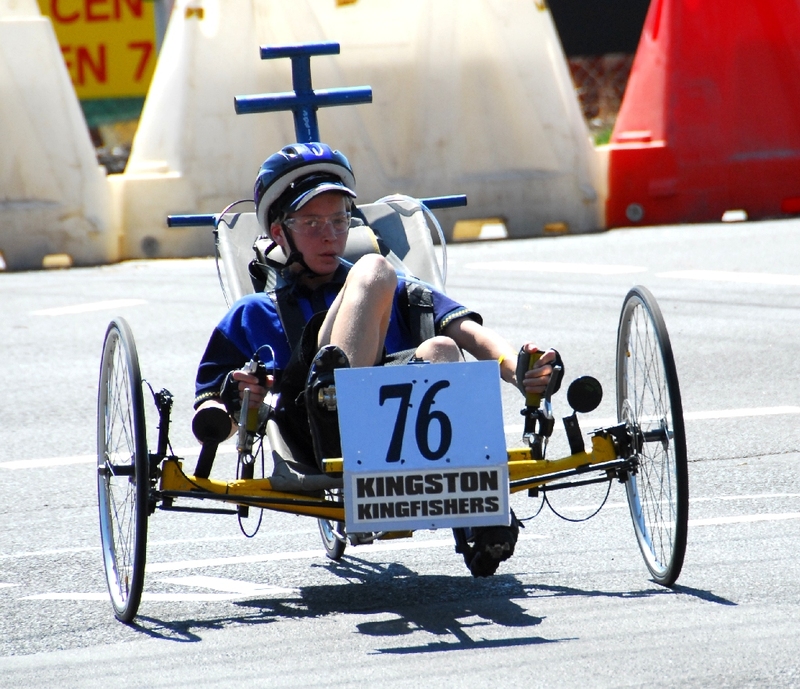 The MTC consists of technical competitions designed for school students, both primary and secondary. The challenges – that are really races – are fun and pedagogically worthy. 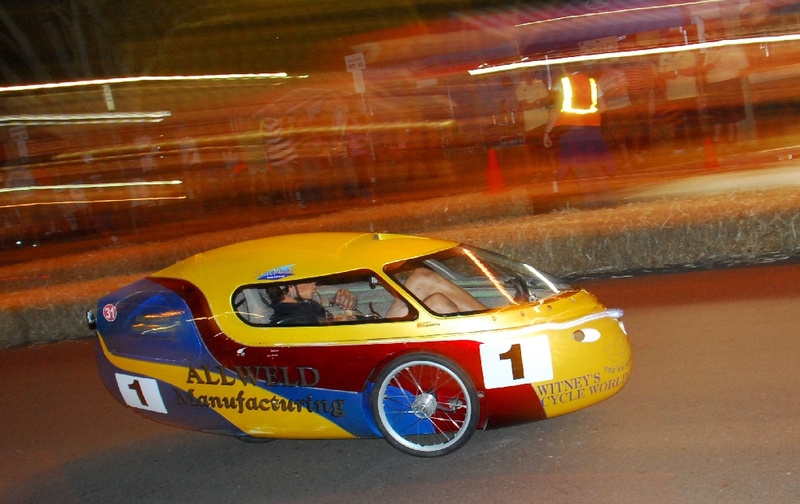 Amongst other events, they consist of pushcart races, solar-powered boat races, robotics challenges, CO2-powered miniature drag racing and a human-powered vehicle race. 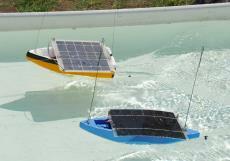 I went along primarily to watch the human-powered race but found myself much enjoying the solar-powered boats. The boats race side by side in pairs, pushing their way through a long shallow pool. They are kept in line by wire guides following two stretched longitudinal fishing lines. The differences in boat performance were extraordinary – some boats just plugged along while others lifted their polystyrene noses and powered through the water, leaving a substantial wake. One student that I quizzed told me the electric motor driving his craft was Swiss-made – it was about as big as an AA cell yet gave the boat amazing performance. And of course, all the boats were directly powered by the solar cells mounted on them. As a way of integrating into the curriculum concepts of hydrodynamics, solar cell and motor efficiency, propeller pitch, renewable energy (and of course team-work and co-operation), I thought the boats were fantastic. I first started left-foot braking about 15 years ago. After reading a story on RWD handling that described left-foot braking, I decided to have a go. The first thing that I found was that after years of accelerator operation, my right foot had developed a super sensitivity – but my left foot was used to only operating the clutch. Left foot braking therefore resulted in a crick in the neck, until I learnt some sensitivity with that foot as well! The worth was proved when I found myself pedalling a loan car, one that handled like it was shod with 75 series rubber pumped up to 20 psi. The auto car had chronic understeer, but – much to my surprise – I found that it could be largely cancelled-out with a dab or two of left foot braking. 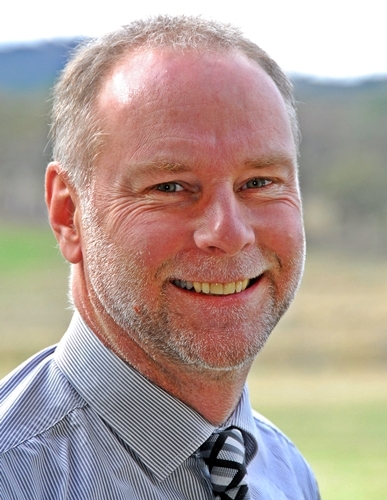 Mechanics and car dealerships that overcharge for services and repairs will now be caught because one of their ‘own’ has created a new business that guarantees fair prices for car owners. The brainchild of Richard Palmer, a mechanic for more than 22 years, ausQuote protects its customers, from being intimidated by mechanics and paying for parts and labour at unfair prices, or worse yet, for parts and labour that are not even required or supplied. Prior to any work being undertaken on the car, the mechanic’s quote is sent to ausQuote who carefully assess it and report back to the car owner on whether they are being charged too much and what repairs should be undertaken and at what cost. Mr Palmer was inspired to start ausQuote after his grandmother was quoted $1596 for a roadworthy certificate in 2004 when all the car really needed was a new headlight globe at a total cost $105! I’ve decided that there’s simply no connection between how much power a vehicle has and the enjoyment gained by driving it fast. 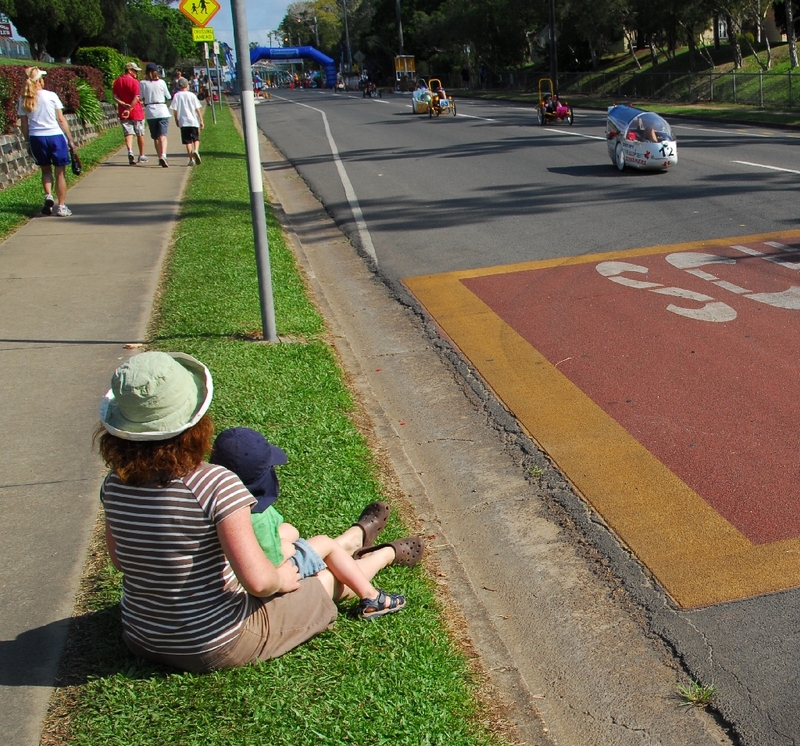 Perhaps that’s in part because I’ve never been much into straight-line drags but it’s also in response to changing mores regarding driving fast on public roads. These days, driving fast needs to be done only around corners. I have replaced Frank the EF Falcon with another car that will in turn be AutoSpeed’s new project car. Ebay auction for the Falcon is here. It’s an excellent car in its final, modified form.